I'm not overly wowed by either, but they aren't bad. 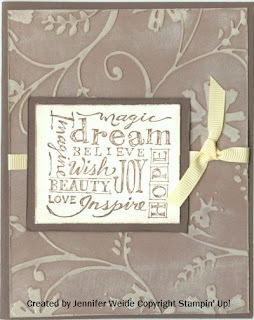 It was my first real attempt at a Cuttlebug Embossed background and trying to apply ink/color. 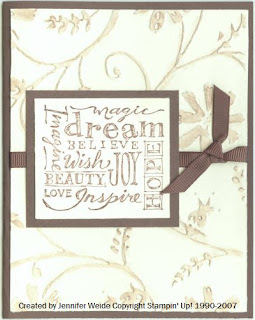 The Brown one I embossed the Close to Cocoa layer, and then smudged over it with the Vanilla Craft pad. The pad is fairly dry, but it still smeared more than I would have liked onto the background. I then tried again and lightened it up by emobssing on the Vanilla. I applied Pastels to the embossed image this time. Better, but tedious. I'm thinking, and will have to try, a more solid image. This one is very open. And, I hate that I have to cover the flowers, my favorite part of the image, to add the words! It just didn't look right to go up or down with them!